Mission: Speak the language anywhere through your iPhone. Struggling with the language barrier in a foreign country? Now there's an app for that. 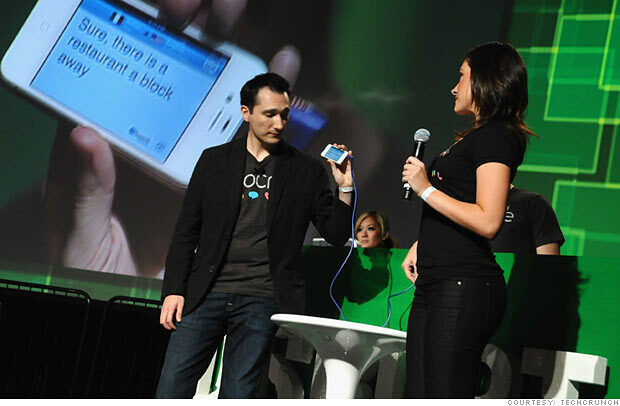 Vocre essentially turns your iPhone into a translating microphone. If you're a non-French speaker in France, pull up the app and speak into your phone. Rotate the phone horizontally and it automatically translates your phrase out loud. Use the phone like a mic: The person you're trying to speak with can respond into it, and the app will translate their response to English. Co-founder Andrew Lauder says the technology is what sets Vocre apart from other translation apps. "It's based on a technology called accelerometer that senses how fast the phone is moving and what direction the phone is moving in," Lauder said. The helps smooth out the tilt-and-talk process. The app is free and comes with 10 free translations. After that, Vocre plans to charge users 99 cents for 10 translation or $8.99 for 100 translations. Turntable.fm's real-time 'DJ for your friends' music service is addictive -- and quasi-legal.